You know that awkward moment when a friend wants to check out the music you’re listening to on your iOS device, but you really don’t want to loan them your earbuds in case they come back, like, grimy? Well, then the MyStream app is for you. MyStream allows users synchronously and share music with other users from their iPhone, iTouch, and iPad through Wi-Fi or Bluetooth within a certain range. All you need to do is to select a playlist from the music or podcasts stored on your device and enable sharing. Another MyStream user will be able to access your playlist and stream the audio on their own device to listen for 30 to 90 seconds (although on my test I got some 22 seconds worth). Listeners can choose to purchase the song being streamed via a direct iTunes link within the app. The app also supports numerous listeners from any one source. 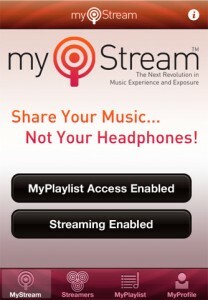 “MyStream was designed to provide users with the ability to ‘Share Their Music Not Their Headphones’,” says Richard Zelson, founder and CEO of RMZ Development LLC, the company behind MyStream. “Artists and labels should love MyStream because it allows individuals to expose their friends to new music (without actually giving it to them), while simultaneously encouraging those new listeners to instantly purchase their own copies,” Zelson says. The MyStream application was designed and developed by ADEV Inc., an interactive mobile design and development lab of new products. “We are very excited to have created such a fun and feature rich application” says Aferdita Muriqi, Principal of Adev Inc.
“Ongoing development efforts will continue to focus on adding new features and functions to enhance the user experience,” Zelson adds. EDIT: Note that you are able to stream songs in their entirety when using MyStream if you are actively playing a song you own and when another user clicks to connects to you – They can listen to what you are currently listening to in full.